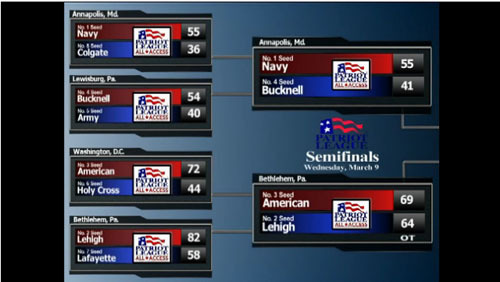 The top-seeded Navy women’s basketball team hosts No. 3 American in the Patriot League tournament final tomorrow. The game will be broadcast at 6 p.m on CBS College Sports. – Neither school has ever won the Patriot League tournament. – Neither team has ever advanced to the NCAA tournament and an automatic bid is on the line. – This is only the third appearance in the championship game for Navy, who is 0-2 all time with their last appearance coming in 1999. – American is 0-3 in the tournament final, losing last year’s game at Lehigh, 58-42. With that said, there’s a lot on the line for both teams.